If you’ve got a birthday coming up and fancy yourself a connoisseur of cuisine, then read on. We’ve got some fantastic foodie birthday party ideas for you to sink your teeth into! If you’re into Italian food, you’ll love this Pizza Making Birthday Party. Warmly welcomed by a nice glass of prosecco and some tasty nibbles (including dough balls and garlic bread to keep with the theme! ), you’ll be taught how to make your own delicious calzone pizza. You’ll start by learning how to toss dough correctly so you can make the perfect pizza base. Then you get to choose from a large selection of fresh ingredients. Make your pizza exactly the way you like it before passing it off to the chef for cooking. While you and your friends wait you can sit in reserved seats of the restaurant and enjoy some drinks. Then the moment you’ve all been waiting for will arrive, and you can tuck in to your tasty creations! That’s the main course sorted, so what’s for dessert? Perhaps one of our Chocolate Making Birthday Parties? 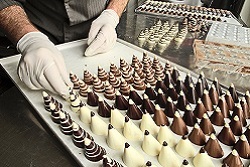 An experienced chocolatier will guide you through the process of creating some gorgeous handcrafted treats for you to enjoy. You can eat them straight away or carefully wrap them up and take them home. As for drinks, why not try a Cocktail Making Class, one of our most popular activities by far. 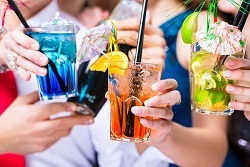 A fantastic way to start the night, learn how to make your very own cocktails from a professional mixologist. After you’re finished you can head off to your reserved seating to enjoy your drinks! Click here for a full list of all our restaurant deals! 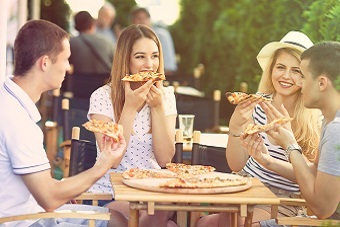 If you’re just after a quick bite to eat before a big night out, then a Finger Food and Fizz Party is perfect for you. Enjoy some prinks and some hot and cold nibbles with your friends before you hit the town. 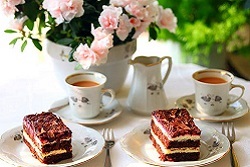 We also offer an exquisite afternoon tea. Enjoy freshly baked scones with sweet strawberry jam and delectable clotted cream and selection of teas, coffee, cakes and sandwiches. Now prepare yourself for this next one, because we’re kicking it up a notch. A whole lot of notches in fact. 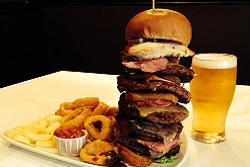 Everything so far has been chilled and fun, but this is the man vs food challenge, and it is not to be taken lightly. If you’re brave enough, step up to the plate (see what I did there?) and attempt to demolish a humongous whopper of a burger in no more than 60 minutes. Do have what it takes to become a living legend? As you can see, when it comes to fantastic foodie birthday party activities, you’ve got more than enough on your plate.